The growing threat of cyber-attacks as well as the increasing sophistication of hackers means that for many firms, hiring a Chief Information Security Officer (CISO) with the right blend of strategic and technical skills to protect their organisation is at the top of the agenda. Unlike some other C-suite positions, the CISO skillset is viewed as highly transferrable across industries, resulting in cross-sector moves between vastly different businesses such as government bodies and global banks. However, the positioning of the CISO within an organisation remains a hotly debated issue and varies between organisations; should it be under the CRO, CIO, COO or even sitting alongside these executives as a peer? 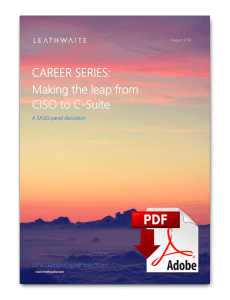 Regardless of these organisational differences, the increasing significance of the CISO position has created an extremely active market, sometimes even described as a ‘merry-go-round’ of market moves. As a result, the role of the CISO has risen to take its place at the boardroom table as a strategic, executive level position alongside the rest of the C-suite.